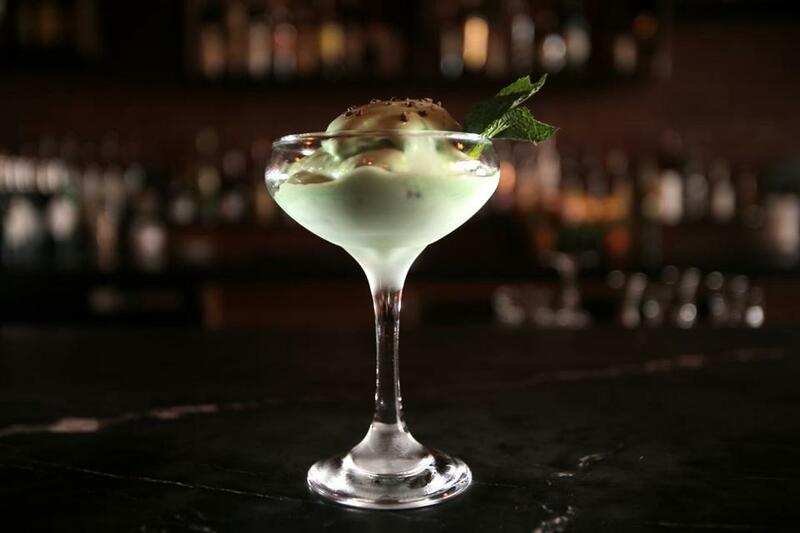 The Grasshopper combines creme de menthe, creme de cacao, and Fernet in mint ice cream base. At < > (read out loud as “Less Than Greater Than”), a hidden cocktail bar in Hudson from the team behind New City Micro-creamery and the Rail Trail Flatbread Co., some of the most exciting potions are neither shaken nor stirred. Instead they are frozen with liquid nitrogen, creating a bit of drama and a lot of smoke. Since New City opened in May 2015, it has drawn crowds from well beyond the immediate neighborhood, with people lining up for silky-smooth, imaginatively flavored ice cream that is flash-frozen with liquid nitrogen. The owners opened < >, accessible only through New City, in October. The idea for the ice cream cocktails “came together when I was adding alcohol to our big batch ice cream,” explains chef Tom Kepner. For the individual servings, he uses about 2 ounces of alcohol to 5 or 6 ounces ice cream base. There are currently three options, which are almost as much fun to watch being made as they are to consume. Tequila Cafe is aged tequila mixed into a coffee ice cream base, served in a Collins glass lined with New City’s hot fudge. The Grasshopper (pictured) combines creme de menthe, creme de cacao, and Fernet in mint ice cream base. This is scooped into a coupe glass and topped with cocoa nibs and fresh mint. And the Old Fashioned, a rich blend of Bulleit bourbon, orange and Angostura bitters, and vanilla ice cream base, arrives in a rocks glass with a rye-soaked cherry on top. In the spring, Kepner plans to add fresh fruit ice cream cocktails, like a strawberry daiquiri. 28 Main St. (enter through New City Microcreamery), Hudson, 978-333-7142, www.newcitymicrocreamery.com.